These "gals" are hilarious! With all of the antic they get into! It is short and enjoyable to read because it rhymes. When children ask to have it read again (and again), you probably won't mind. Early readers will think it cool to read out loud to themselves or siblings. 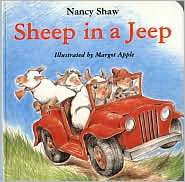 The author Nancy Shaw teams with her illustrator Margot Appler to write several other books with the main characters being these crazy/silly sheep. Click on the link below to go to Nancy's web page and view all of the many adventures that these silly sheep get into.